Summon two 1/1 Imperial Grunts to a lane. Crassius' Favor is a rare Willpower action card. It is part of the Houses of Morrowind expansion. "How can uncle Crassius help?" 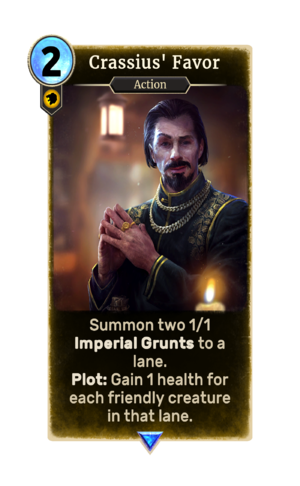 This card depicts Crassius Curio, who also appeared in Morrowind. This page was last modified on 27 November 2018, at 23:28.